Anyway, I wanted to check this place out so I dragged NF here with me. (NF didn’t realize there was a cafe at the back of Coppersmith, either.) On the menu are panini’s, donairs, salads, sandwiches, wraps coffee, soup, hot entrees like tandoori chicken and pasta, various pastries… lots to choose from. There are also things like sandwich/soup deals for something like $6.99. The service is pretty nice, neighbourhoody. We ordered, took a seat inside (there are two tables outside) our sandwiches came in about 10 minutes. 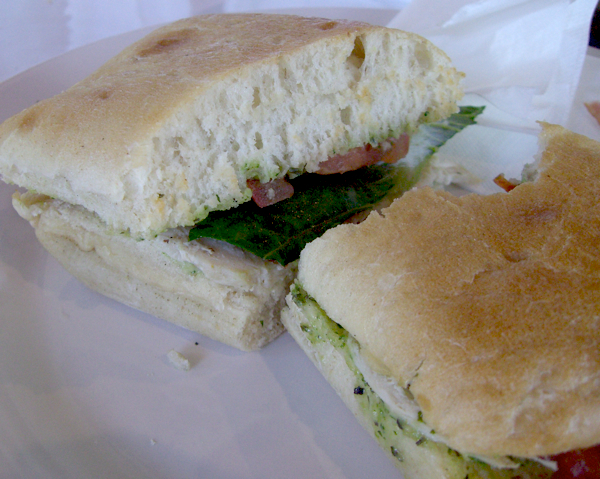 The ciabatta they used had a thin crispy crust and very soft fluffy crumb, it was pretty good, light bread. They didn’t use a panini press though, seems like the bread is just toasted. 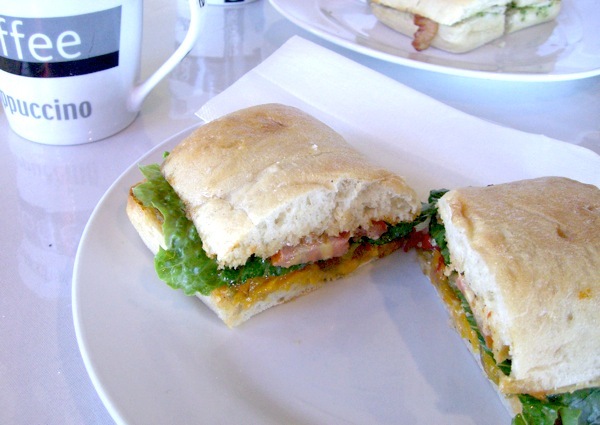 The veggie panini I liked- I think it was like this pepper relish that dressed it and that tasted really good. The portion sizes aren’t huge, but just good for me, though larger appetites may need something more. This is a nice spacious spot and pretty cozy. There is free wireless access and a big screen TV with several couches in front of it, but the TV wasn’t on. It was lunch time so it was obvious that a lot of customers were from surrounding offices. I’d definitely come back to try out their other menu items. For a fast, good, casual lunch spot, the selection and quality sure beats the other similar choices in the mall (Tim Hortons, McD’s etc). At least they’ll have decent coffee! The day before my surgery last week, W and I had lunch at the Tomato Fresh Food Cafe. This would be their new home in Kits that opened this summer, after the Canada Line construction forced them to move from Cambie Street. I like their warm, casual, and inviting decor: the restaurant is brightly lit – mainly by skylight, there are large indoor trees, the restaurant is very spacious, and the bars and booths are comfortable. Definitely more trendy and sophisticated compared to the old Cambie location. We arrived at about 1pm. The place was busy but not full, but they still make you sit in the little waiting area (with tables and comfy couches) for about 10 minutes before they seat you. We were seated by a big tree near the back of the restaurant. W and I shared two sandwiches: the vegetarian with hummus and mayo. The hummus was OK. I ordered it on the sourdough (instead of the whole wheat). The sourdough was OK, not that sour, not that crusty, and I think there is some whole wheat flour in it. Overall, it was an OK sandwich. And we also ordered the lox and cream cheese on a bagel. I love lox and cream cheese. This was very good. (Though I have yet to compare it to the same thing at Siegel’s or Solly’s.) The smoked salmon and capers were quite fresh. The bagel itself was great. It was a sesame bagel, with a nice chewiness and slight sweetness to it. I wonder where they get their bagels from. I like how things are freshly made here, and you can ask them to make a particular sandwich on the menu to your liking. The atmosphere is nice and relaxing, though if I was in a hurry for lunch I might just pack my own sandwich, because it does take a while for them to seat you and then for the food to come. Two little things: They didn’t refill our water even once, and a leaf fell on W’s head while she was eating her bagel. 😀 Otherwise, a nice place and I might revisit for the brunch menu.